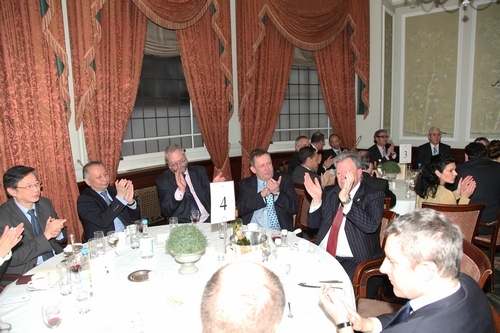 As we usher in a new year, it is a real pleasure for me to join you at the London Capital Club, a club with a proud history of 170 years. For the theme of my speech I am taking inspiration from the name of your Club. Also it is relevant we are gathered here at the heart of the financial capital of the world. I want to talk about something related to capital. This is investment which is very much the business of the City of London. On January 3rd the Financial Times published the outcome of Ipsos Mori’s annual ‘Captains of Industry’ survey. The analysis shows 23% of the 103 chairmen, executives and senior directors questioned see China as the most attractive country for investment. This rate is way higher than Brazil with 17% and Britain with 8%. This quantifies how China has become the top investment destination of British business leaders. This Ipsos Mori’s survey is not the only proof. The World Investment Report 2012 produced by the UN Conference on Trade and Development also ranked China as one of the investment destinations most favored by multinationals. Another measure is that last year China attracted 110 billion US dollars foreign investment. In the first half of last year China had overtaken the United States to become the number one country recipient of foreign investment. · Why does the world still take a positive investment view of China? · Why do foreign business leaders see China as their best investment choice? I believe China’s attraction comes from both ‘stock’ and ‘increment’. By ‘stock’ I mean what China has gained from more than thirty years of reform and opening up. · China now has a well developed infrastructure system. · In transport Chinese road, rail, sea and airports match, or are more advanced, than those of the developed countries. · With digital information China leads the world in scale in the operation of mobile and internet networks. · China has become the ‘workshop’ of the world but is now rapidly moving up the value added ladder, such as through R & D.
· The Chinese people are the world’s largest skilled labour force. · China has instituted an open, transparent, efficient and safe economic system. All these factors show China has unmatched advantages both in infrastructure and services. It all adds up to a sound environment for investment. Turning to my second point about ‘increment’. By increment I refer to the enormous potential of China’s development. At the end of last year the Communist Party of China successfully held its 18th National Congress. This Congress drew up a ‘blueprint’ for China in the next five years and beyond. It also laid down the guidelines and set out the goals for the future. All these will turn into massive driving forces as China advances. These are some of the key drivers. First, income rises. The 18th Party Congress set the goal of doubling per capita income of Chinese people along with China’s GDP by 2020 based on the level in 2010. This means 6.4 trillion British pounds of purchasing power in the Chinese market. · Late last year both Jaguar and Rover reached agreements on joint venture with China’s Chery Automobile. Together they will invest more than 1 billion pounds to make British cars in China. · Britain’s favourite coffee shop, Costa, plans to double the number of their shops in China to 500 by 2016. Costa believe that with enhanced spending ability, the annual intake of coffee of Chinese people per head will grow rapidly. Costa estimates annual consumption will rise in China from the current 3 cups to something close to the world average of 240 cups. The second growth driver is urbanization. The 18th Party Congress stated that China’s cities and the country would develop side by side. It laid equal emphasis on industrialization, information technology, urbanization and agricultural modernization. China’s current urbanization rate is 53%. This is much lower than the average level of 80% in developed countries. During the next two decades urbanization in China will accelerate. Every year large numbers of rural people will move to cities. The pattern of the past thirty years in China demonstrates this migration of people will not only add to urban workforce, but also drive investment and consumption. Urbanization will be a master engine for China’s economic growth. It also holds out enormous business opportunities for the whole world. It needs to be stressed that in advancing urbanization China will set store by quality and pay greater attention to city planning. China wants to build ‘sustainable cities’. In this area China and UK already have had collaboration. I am sure we will have broader prospects in the future. The third driver is innovation. The 18th Party Congress set the task of shifting the economic growth model of China. One aim is to make the Chinese economy innovation driven. This means China will reduce its dependence on production factors and export for growth. Rather China will become an innovation driven economy where productivity is boosted through advancement in science and technology. China will enthusiastically encourage the development of high technology and use this to upgrade traditional industries. In parallel with this trend China will further strengthen IPR protection. China will also open itself to more international cooperation in science and technology. Britain has a global reputation for strong innovation capacity and leadership. Every year the UK is among the leaders in the league table of R&D outcomes. However, due to limited market size and demand within Britain, these outcomes cannot be fully commercialized. This is where China can help. 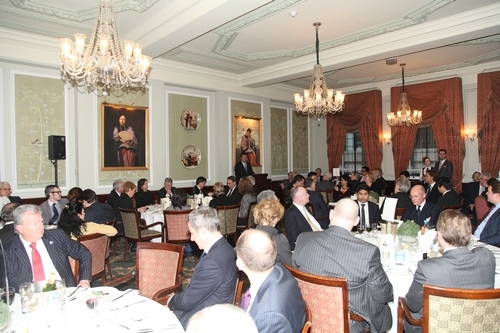 I suggest in the future China and Britain strengthen joint investment in R&D and collaborate in its commercialization. I am sure such shared action will benefit both of our countries. The fourth driver is to create a ‘beautiful’ and sustainable China. Environmental issues assumed pivotal prominence during the 18th Party Congress. It was placed on a par with economic, political, cultural and social undertakings. They together constitute a ‘five-in-one’ master plan for China’s future. We aim to build not only a strong and prosperous China, but also a ‘beautiful’ China. Our goal is to achieve sustainable development of the entire Chinese nation. · Conserving resources and energy. Environmental issues involve a profound economic transformation and comprehensive industrial upgrading. It will also create immense business opportunities. Some experts have estimated that during the 12th five-year plan period, China’s green investment will amount to 800 billion pounds. This might be the world’s largest ever. Here lies a great opportunity for Britain. The reason is that the UK is a global leader in energy conservation and environmental protection. Britain can boast about a wealth of experience in environmental management. · First, help protect China’s gorgeous mountains and rivers. · And second generate handsome financial returns for enterprises in both countries. The fifth driver is called the three ‘equalities’. The 18th Party Congress stressed fair competition among different ownerships in Chinese economy. It specified the principles of ‘equal access to production factors, equal participation in market competition and equally protected by the law’. · National treatment for all. · Equal rights and opportunities for all. · And equal rules applied to all. In addition, China’s legal system and rule of law will continue to strengthen. In turn, China’s investment environment will be further improved. Monopolies will not be tolerated and so market access expanded. · China’s investment environment will be even better. · China’s economic future will be even brighter. 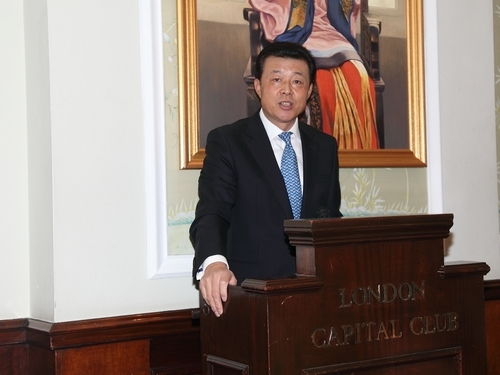 · In the future China will remain a wise choice for British and international investors. So far my focus has been on inward investment into China. Now, I will turn to another topic of much interest. This is China’s overseas investment. From January to November last year China directly invested in 130 countries and regions around the world. The non-financial direct investments totaled 62.5 billion US dollars. The figure for the whole year is expected to top 70 billion US dollars. · Chinese enterprises will become more multinational. · China will foster a group of multinational companies of its own. · These will emerge as world class. The consequence of these trends means China’s overseas investment will increase. Great efforts will be made to better locate its presence across the world in industries where China has advantages. · Support for international trading operations. 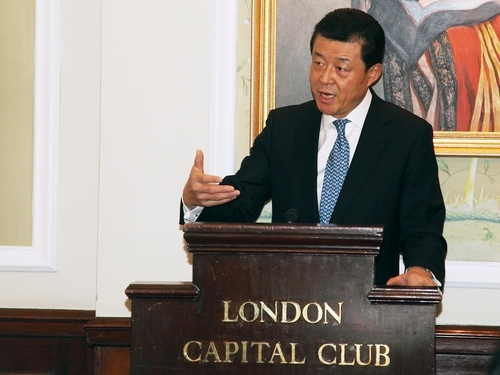 · China Investment Corporation invested in Thames Water. · Huawei announced it would spend 1.3 billion pounds on investment and purchase here. · China’s Brightfood bought shares of Weetabix. In the energy sector, several big deals of Sinopec and CNOOC also involved a large expansion of operations in the UK. Major Chinese commercial banks all set up branches and subsidiaries. This has led to opening new office buildings in Britain. Why did Chinese companies choose Britain? In my view this to a great extent is because of the British government’s policies. The policies are open, encouraging and welcoming to Chinese enterprises. So it is only natural that Chinese enterprises have chosen Britain. In contrast it is disappointing that the situation across the Atlantic is not as open. There Chinese companies have been frequently obstructed for political reasons. For example, the US Congress rejected merger deals of Huawei and ZTE for considerations of ‘national security’. The US administration also forbade a member of China’s SANY Group constructing wind farms in the US. The reason they gave was the same—national security. Cases as such are troubling for China’s overseas investment, for some countries are in fact protectionist in the name of national security. It is gratifying that I find most British media have taken an impartial position and criticized the United States. · Remain committed to its open policy. · View China’s overseas investment from a reasonable and open minded perspective. · Take active measures to create an enabling political environment for bilateral relations. You belong to the business and financial elites of Britain. I have no idea whether you were among the 103 questioned by IPSOS MORI. Nor do I know whether you contributed to that 23%. If ‘Yes’, I congratulate you. If ‘No’, I hope my speech today will motivate you to re-evaluate your decision. · There are multiple reasons for you to be optimistic about China. · There are immense opportunities to profit from investment in China. · There are great gains to be won for supporting and welcoming investment from China.